Of the approximately two dozen artists we’ve met already in rock’s journey there have been a fair number who will leave a large imprint on the music’s development over the years. Some, like Roy Brown, Wynonie Harris, Amos Milburn and The Ravens, will come to define the late 40’s and early 50’s rock scene. 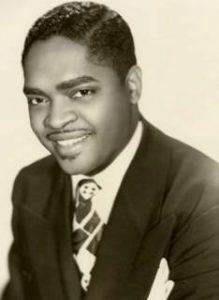 Others like Ivory Joe Hunter and Smiley Lewis have their longest lasting notoriety come from recordings in the 1950’s. Still others, such as Dave Bartholomew, will become known far more for behind the scenes work as a producer, even while churning out records that were more than incidental footnotes. Not all of these names, sadly enough, are universally familiar to the common run-of-the-mill music fan in 2017 of course, but then again nobody can claim to be a rock history authority without knowing who they are and what they accomplished. Now we meet someone who probably falls well short of all of those figures listed above when it comes to modern name recognition. Somebody who, when simply looking up chart figures alone to try and establish his place in history, will barely make a dent under his own name as an artist thus leading many to believe upon seeing the name for the first time here that Paul Gayten will wind up sharing space on the bottom shelf in the far back corner of the musty cupboard of early rock history alongside unopened cans of Gene Phillips and Jump Jackson. For while widespread acclaim for his role in shaping rock is definitely lacking compared to the rest he may in fact be as responsible as any for its appearance in the first place, as well as earning the right to be seen as one of the most important and versatile figures on the scene in rock’s first dozen years. In fact his overall résumé when taken as a whole arguably stacks up to virtually anybody we’ll come across. More than anything else though Paul Gayten is somebody whose name should be exonerated among rock fans, for without him we may not even be talking of rock music as a commercial entity. We’ve made mention that before Roy Brown sprang this heady concoction on the world back in September 1947 with Good Rocking Tonight there were some other songs which, commercial and cultural impact aside, contained the proper musical components to be thought of as rock ‘n’ roll. One of those songs was cut by Paul Gayten back in the spring of ’47 called Your Hands Ain’t Clean, a storming workout featuring Gayten’s pounding piano, soulful exuberant vocals and the requisite hell-raising attitude that soon came to define rock. However it wasn’t a hit… in fact, it wasn’t even the A-side of the record which was a treacly ballad called True. That was the focal point and – let it be made perfectly clear – the hit as well. It seemed even then, just a few short months before Brown’s breakthrough, that if you had what it took to be a rocker you still weren’t going to be rewarded for it which made rock’s subsequent rise to prominence that fall all the more noteworthy, but let the record show that Gayten had what it took, commercial response be damned. But despite that record’s failure to connect at the time he had a calculable effect on OUR topic at hand, rock ‘n’ roll, nevertheless because in scoring with True he still became the first of the “modern” singers from New Orleans to leave a mark on the broadening market. In addition he soon launched the career of another hit-maker whom we’ve already met named Annie Laurie, who had an even bigger smash that summer (with another mild ballad, in case you were wondering) when backed by Gayten. What all this meant was their success on DeLuxe Records helped convince the label’s owner, Jules Braun, that something was stirring in New Orleans that could spread elsewhere and thus when Braun was contacted out of the blue (by Cecil Gant, a non-Louisianan on the label, who nonetheless was in New Orleans at the time) and asked to listen to a song by an unsigned kid named Roy Brown… well, the rest is history. The New Jersey-based DeLuxe quickly made New Orleans its second home, snatching up a handful of other artists from Gayten’s neck of the woods and soon those artists would define rock’s earliest months. Which brings us back to Paul Gayten himself. If all he wound up being was the one who’s early pre-rock success opened the door to New Orleans artists who otherwise might’ve gone unrecorded that’d still be worth plenty. But Gayten was too talented and too ambitious to take a back seat to those who came along after he’d made their signings possible, and if rock was what the burgeoning audience wanted, well, he’d already shown he knew how to do that too. If you have a sense of déjà vu looking at the name in the title – Peter Blue – aside from showing that you’re a regular reader of Spontaneous Lunacy (good move!) you may have already made a few connections. Gayten was from New Orleans as was Cousin Joe who sang about Boxcar Shorty And Peter Blue back in September. Obviously this Peter Blue must’ve been something of a notorious fellow down in the Crescent City at the time. That’s what I figured too when first encountering this, but listening to it I’m no so sure. Oh, I will agree that the NAME is one that was probably on a lot of people’s tongues down there, but unless this is a prequel of sorts to Cousin Joe’s tune then this is another cat entirely, because… well, for starters, this one is alive, and as those who read the review for Boxcar Shorty And Peter Blue know, THAT Peter Blue wound up in the grave in a most violent fashion. On Peter Blue And Jasper Too – regardless of who Mr. Blue is – Gayten’s halting, choppy piano opening catches your attention right away. It’s very crude certainly not up to the smooth standard those who heard the likes of True the previous spring would expect. Yet for a rocker this style is far more fitting, especially when he starts moving some and laying down the bassline with his left. It sounds impatient… restless even, leaving you anticipating what’s to come. When Gayten launches into the story with an easy styled vocal it manages to be both urgent and laid back at the same time and things are looking up. The trading off between Gayten and his backing vocalist, echoing his lyrics very effectively, even if all they’re adding is atmosphere since the words they sing we’ve just heard coming from Gayten, has an addictive quality to it. If you find yourself singing along by the second refrain you won’t be alone, and that’s probably the whole point. It’s catchy as all get out, building your enthusiasm one chorus at a time. They’re touting the prowess of Peter Blue – “he ain’t no fool/he ain’t no clown” – but we don’t know yet what exactly he’s made his name on. Or should I say names plural, because it appears Jasper is merely an alias leading one to suspect that this guy is no stranger to the seamier side of the tracks. After a stinging yet humid guitar solo by Jack Scott we’re then taken around the corner to meet a girl that has all the guys in town tripping over themselves to be with, though again the “whys” are conspicuously absent from the telling. Are these two characters destined to meet up and if so what kind of fireworks will occur? If it’s anything like the riveting conclusion to Cousin Joe’s tune then this could be something special. Another instrumental solo follows, this time with Gayten stretching out on the keys showing why he was in such demand over the years to back so many others on record, before the wordless chanting that makes up the bridge simply brings us back to the “chorus” which as we know from earlier is merely a question posed without answers about what Peter Blue can do. But we never LEARN what he can do, or even what the hell they’re talking about for that matter, because following another brief “hoy-hoy” chant they close things out. But before you walk away mad, feeling like you paid $15 to see a movie only to have the last scene edited out, or been told an elaborate joke only to miss the punch-line, the end result isn’t all a massive let down. Frustrating as hell, yes, even more so if you’re the type who listens to lyrics intently, as I tend to be, and in that case this sense of being disappointed will be more pronounced. But the music is so mesmerizing, the singing is first rate, especially the give and take with the backing vocalists, and the instrumental passages are strong enough to pick up the slack of having no plot to delve into. Most of the components for a good song, a very good song in fact, are not just here, but assembled credibly. The one thing they lack is something they may never have intended to give us in the first place, IE. “the real plot” which by all indications might’ve been something they were unwilling to divulge for fear of retaliation or possible indictment if this Mr. Blue lives up to the reputation they hint at within. So as long as you realize that this isn’t a STORY song at all, you’ll be alright. Boxcar Shorty And Peter Blue was of course a great story, a juicy novel crammed into 3 minutes with a rousing soundtrack behind it to boot. By comparison Peter Blue And Jasper Too is simply a character sketch. A brief glimpse at some of the colorful personalities you might meet on the streets of Naw’lins in the late 1940’s. That we don’t get to find out what they do – on their own or to each other – is unfortunate I suppose, but not because we feel we’ve been left hanging… not when we’ve been given no plot set-up to start with. No, it’s merely unfortunate because the characters themselves, not to mention Gayten singing it, come across within the first few seconds you hear them (or hear OF them) as being compelling figures and thus you simply want to hear MORE. But if you go into this with the right frame of mind, that of immersing yourself in the atmosphere of New Orleans as opposed to trying to act as a reporter and get enough facts to piece together a coherent story from what you’ve been told, this one will do just fine and more than anything make you want to sidle up to a bar, order a po’boy sandwich and a bottle of Jax beer and hang around to see what might wind up going down around you in such a vibrant place as this. Leave a reply on "Paul Gayten: “Peter Blue And Jasper Too”"